These dry netted 5 ounce aromatherapy canister beads for hot tubs are specially manufactured for use in spas and baths. Simply place a Bead Net directly into the aroma air canister and relax while the wonderful aroma of clary sage, lavender, peaceful chamomile or peppermint eucalyptus envelopes your spa. These fragrance bead pouches go into the pre-plumbed aromatherapy canister, usually activated by a spa blower. If you don't have this aromatherapy system installed in your spa, then you may like our liquid or crystal aromatherpy fragrances. Price is for a 4-pack of assorted Airomatherapy beads - one of each scent: Peaceful Chamomile, Clary Sage, Lavender and Peppermint Eucalyptus beads. Or you can also buy them individually on our site as well. Enjoy the wonderful fragrance of aroma from your spa to enhance your hot tub experience. 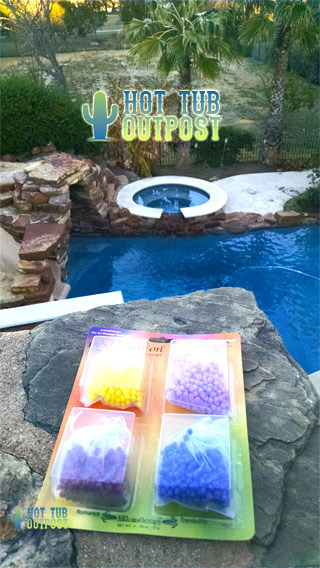 Enhance your aromatherapy experience with Insparation's "Airomatherapy Beads" from Hot Tub Outpost. Specially formulated sachet for spas, hot tubs and whirlpool baths with air passage units/aromatherapy bead canisters. "For the Scents of Well-Living"